Rob Boyd, CEO and Founder of The Streets Don't Love You Back Movement, Welcomes you. Please join us! Our goal is to educate our youth about the dangers of gang violence and drugs and that there are many alternatives to the “gang/thug” life. “The Streets Don’t Love You Back: A Story of Strength, Prayer, and Perseverance” by Robert Boyd. The autobiography of a man who grew up in the eastside ghetto of Detroit MI. His father a prominent Reverand and well known Author chose not to be a part of his life. His stepfather was a good man and treated him and siblings as his own, until one day when he was nine years old he watched his stepfather get stabbed to death. He then trusted no one, and after being robbed by a young gang member at age 10 he turned to the streets and started living the gang life. He was involved with a lot of dangerous situations at an early age and ended up in a home for troubled boys. He remained involved in the gang life until one day he realized that the streets dont love you back. His mother never turned her back on him and prayed that he would change his life, She was the inspiration that gave him the strength to turn his life to God and become a successful business man. This manuscript is definitely a story of Hope, Change, Healing and Forgiveness. A must read book about some of Detroit’s biggest drug lords of the 70’s, 80’s and 90’s that were brought down in the 90’s. The Clifford Jones gang, Big Ed Hanserd, Maserati Rick Carter, The best friends, Demetrius Holloway, White Boy Rick Wershe, 430 Crew, Butch Jones a.k.a. (Y.B.I. ), The Chambers Brothers. After reading this book you will see that crime doesn’t pay and “The Streets Don’t Love You Back” All of these guys made millions of dollars on the streets of Detroit and you will find out what happened to each of us. A MUST READ BOOK............ !!! Rob Boyd is the CEO/Founder of “The Streets Don’t Love You Back” Movement, , and Producer of The Keep It Real Show in Cincinnati, OH. thanks to seven cups coffee there is always someone to meet that is giving back to help our youth and others. i met mr.steve stahl chief of police of maricopa az and he told me he had a young man he would like the streets dont love you back to work with.god is great all day everyday.we took a picture together but some how it didnt save in my phone. May God bless you for your hard work! Thanks for the welcome attachment. Check out ARTIST.........RB's StoreWidget with t-shirts, downloads, and ringtones, http://www.reverbnation.com/controller/widget_code/audiolife_store_popup/artist_541235?widget_id=38 if you like it put it on your website! 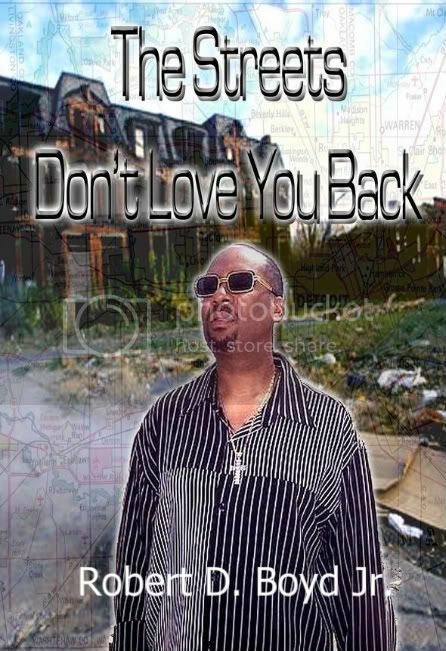 The Streets Don't Love You Back's doXtop - Get Published!